You can provide the Interest Profiler to your own site's audience through a direct web link, by including our IFrame Widget, or by using our web service API. The feature is available in English or Spanish. Adding the Interest Profiler as part of your own site is easy with our IFrame Widget. By adding a small snippet of HTML to your site, the Interest Profiler can appear alongside your site's own branding and navigation. To see the Interest Profiler in action, try it out at My Next Move. Sign up now for our free developer program, and you'll receive HTML code for adding the Interest Profiler widget to your site. 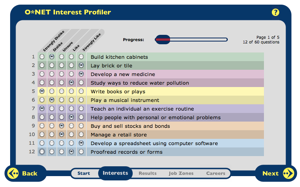 Want to integrate Interest Profiler results with your own career tools and information? With our RESTful web services API, you can take advantage of the Interest Profiler's scoring algorithm and structure while providing a unified, customized experience for your audience. In addition, a "mini" version of the IP useful for mobile assessment settings is also available. See our Reference Manual for complete documentation on our Interest Profiler and other web services. Then sign up for our developer program to add these services to your own site or application. The Spanish-language Interest Profiler from Mi Próximo Paso can also be added to your site. We provide both an IFrame widget and a full web services API, so you can leverage this tool in English or Spanish for your audience. Sign up for our free developer program to receive HTML code for the widget and to access the web services. O*NET Interest Profiler Services by U.S. Department of Labor, Employment and Training Administration is licensed under a Creative Commons Attribution 4.0 International License.